Floating solar panels utilize the same technology as the panels that you put on your roof. The main difference is that they’ve been adapted to fit onto floating platforms, which are designed to be placed on lakes and quarries. While the technology still hasn’t evolved the point where it can be used on the open ocean, we cannot say what will happen in the future. For now though, floating solar panels are a great new technology that’s promising to change the way we look at renewable energy. 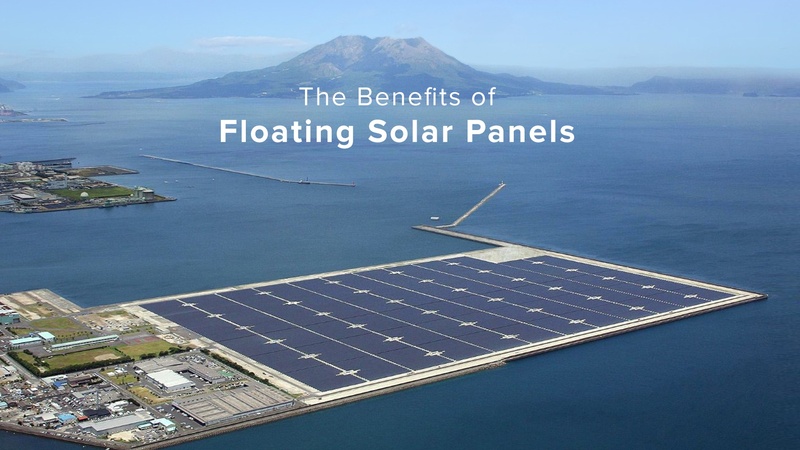 What are the Benefits of Floating Solar Panels? Solar panels actually work better when they are cooled. That’s why if you have two identical systems, one on land and one on the water, the one on the water is going to actually perform better. This is why a country like Germany, which is not known for it’s tropical climate, can be one of the leading countries when it comes to solar power. Another advantage of floating solar panels is that they can shade the water they float on and reduce evaporation by up to 70%. For example, if a 3 acre water storage pond was covered with solar panels, 4 million gallons of water could potentially be saved from evaporating every year. Also, the solar panels prevent sunlight from hitting the water which can slow down algae growth. When it comes to energy generation, one square acre of floating solar panels is capable of generating 500,000 kWh. These solar panels are also a smart new technology because they can be deployed in cities and towns without a lot of space. Obviously a country like Japan is a good example, as they are always dealing with a lack of space. However, municipalities across the world are finding out that when they don’t have anywhere else to put solar panels, they can always put them on the water. Where is the Technology Being Used? At the moment, the Japanese currently have the largest floating solar power system in the world. Located at Kyocera, this massive solar panel farm is comprised of over 9,000 panels and it generates 2,680 MW of energy every year. Japanese engineers claim that the system is very durable and will be able to withstand gusts of wind in excess of 100 mph. However, Japan is not the only country interested in this new technology. Brazil has recently announced that it wants to build a gigantic 350 mw solar energy farm. This is going to serve two purposes for Brazil. First, it’s going to give them a big boost of renewable energy. Second, it’s going to slow down evaporation. This is a big deal for Brazil, as the country is dealing with serious water shortages. Compared to countries like Japan, the technology is still not as popular in America. Our huge landmass means that we always seem to have a place to put our solar panels. Also, favorable climates in places like the Mojave desert, have lead us to build some really cool things. Like the largest solar panel farm in the world, which is capable of powering 160,000 California homes every year. Despite this, floating solar panels are beginning to gain some ground in America. It’s likely to end up being very popular in cities like New York, Chicago, and Los Angeles, which don’t have a lot of free space to work with. In fact, LA just missed a fantastic opportunity to install floating solar panels. Recently the city government dropped 96 million shade balls onto a reservoir in an attempt to reduce evaporation and conserve water. If they had spent the money to build a floating solar panel system instead, they could have been far more environmentally friendly, and achieved the same thing. Hopefully they think of that next time! As floating solar panels gain popularity and more people find about the technology, we should see the technology used more heavily across the United States. For now though, roof solar panels are the go to choice for people looking to invest in green energy. They’re affordable, durable, and they can help you to save big on your electricity bill. If you want to find out more about installing a system on your home, talk to Pick My Solar today! We’ll have help you to get the best price, and make the installation process as seamless as possible. That’s a guarantee that you can take to the bank.